As much as eight centuries were recorded which included a double ton at the end of the second days play in the ten Premier league cricket matches that were played around the metropolis. The best knock came from Tamil Unions Rumesh Buddika who slammed a career best unbeaten knock of 203 against Kurunegala YCC at P. Sara Stadium which saw Tamil Union resuming on their overnight score of 209 for 3 make a mammoth 466 for 4 declared. The left handed batsman made his knock off 274 balls which comprised 13 boundaries and a six as he along with Jeewan Mendis who remained unbeaten on 100 with seven boundaries put on an unbroken 179 runs stand for the fifth wicket. Earlier Rumesh was associated in a 144 runs partnership with skipper Sachithra Serasinghe who chipped in with a fine knock of 82. 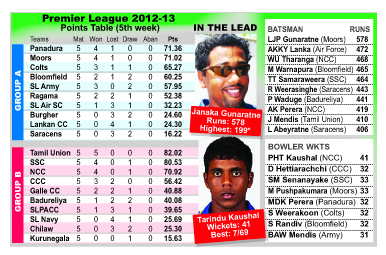 Kurunegala YCC in their turn were badly placed on 160 for 5. Nisal Randika too cracked a career best knock of 158 for Colts and followed it up with a five wicket haul against Air Force in the match played at Rifle Green to put his side on top. Nisal’s 235 ball knock had 13 boundaries and five sixes which helped Colts resuming on their overnight score of 254 for 4 end their inning making a score of 464. SSC having declared their innings on 354 for 8 had CCC struggling on 219 for 9 at the CCC ground while NCC having ended day one on 219 for 4 was bowled for 275 by Badureliya CC who ended the day on 176 for 8 at the NCC ground. An unbeaten 128 inclusive of 15 boundaries and a six by skipper Manjula de Zoysa and supported by half tons from Seekkuge Prasanna and Rishan Kavinga saw Army resuming from 259 for 5 post a formidable score of 401 against Ragama CC in reply ending day two on 236 for 4. Moors SC have already obtained a first inning lead over Lankan CC with Moors SC in reply to Lankan CC’s 190 resuming on their overnight score of 33 for 1 making 232 at Braybrooke Place. The second days play in the match between Bloomfield and Saracens SC got off to a late start with the home team who were 183 for 5 making 314 for 8 declared and Saracens SC ending the day on 187 for 6. 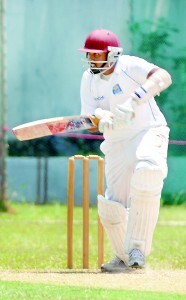 Chilaw Marians was on top against Navy SC at Welisara while Sri Lanka Ports Authority had Galle CC struggling in the match at Colts ground and Panadura SC dominated the proceedings against BRC at BRC ground.